2,6-Dimethylnaphthalene (2,6-DMN) is a commercially important chemical for the production of polyethylenenaphthalate and polybutylene naphthalate. However, its complex synthesis procedure and high production cost significantly reduce the use of 2,6-DMN. In this study, the synthesis of 2,6-DMN was investigated with methylation of 2-methylnaphthalene (2-MN) over metal-loaded beta zeolite catalysts including beta zeolite, Cu-impregnated beta zeolite and Zr-impregnated beta zeolite. The experiments were performed in a fixed-bed reactor at atmospheric pressure under a nitrogen atmosphere. The reactor was operated at a temperature range of 400–500 °C and varying weight hourly space velocity between 1 and 3 h−1. The results demonstrated that 2,6-DMN can be synthesized by methylation of 2-MN over beta type zeolite catalysts. Besides 2,6-DMN, the product stream also contained other DMN isomers such as 2,7-DMN, 1,3-DMN, 1,2-DMN and 2,3-DMN. The activity and selectivity of beta zeolite catalyst were remarkably enhanced by Zr impregnation, whereas Cu modification of beta zeolite catalyst had an insignificant effect on its selectivity. The highest conversion of 2-MN reached 81%, the highest ratio of 2,6-DMN/2,7-DMN reached 2.6 and the highest selectivity of 2,6-DMN was found to be 20% by using Zr-modified beta zeolite catalyst. 2,6-Dimethylnaphthalene (2,6-DMN) is a crucial chemical as a feedstock material for the production of high-performance polyester resins such as polyethylenenaphthalate (PEN) and polybutylene naphthalate (PBN). There are many expected PEN applications in film and bottle uses, refillable bottles, advanced photosystems and tire codes (Motoyuki et al. 2000). 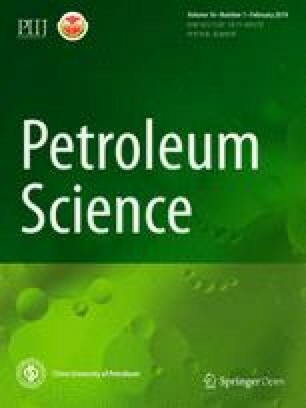 PEN shows good thermal and mechanical stability (Pu and Inui 1996) and superior properties such as higher gas barrier, tensile strength, heat resistance and stability against UV light and X-rays in comparison with polyethylene terephthalate (PET) (Güleç et al. 2016, 2017). The main applications of PBN are expected to be for electronics, insulators and car parts (Motoyuki et al. 2000). However, due to the complex synthesis procedures and lack of effective process for the commercial synthesis of 2,6-DMN, PEN and PBN have not been widely used in industrial applications (Motoyuki et al. 2000; Niftaliyeva et al. 2015; Güleç et al. 2016). To produce 2,6-DMN, a few synthesis procedures have been developed such as methylation (Pu and Inui 1996; Park et al. 2002, 2005; Jin et al. 2006, 2008; Song et al. 2007; Zhang et al. 2007; Zhao et al. 2008; Bai et al. 2009; Liang et al. 2010), disproportionation (Niftaliyeva and Karaduman 2015; Güleç et al. 2016), alkylation (Fraenkel et al. 1986) and isomerization (Motoyuki et al. 2000; Ferino et al. 1996) with a naphthalene or methylnaphthalene sources. Direct synthesis of 2,6-DMN has been investigated by methylation and disproportionation of naphthalene sources over different kind of zeolite catalysts such as Pt-, Fe-, Ti-, Zr- and Co-modified ZSM-5, ZSM-12 and La, Cu-doped Y zeolite by (Jin et al. 2008). Pu and Inui (1996) studied the methylation of 2-MN over zeolite catalysts including ZSM-5, Fe-MFI, Zn-MFI and Pt/ZSM-5 in a fixed-bed flow reactor. Fe- and Zn-modified MFI silicates showed higher 2,6-DMN/2,7-DMN ratios and higher β,β-DMN selectivity compared with ZSM-5. On the other hand, the metal silicates demonstrated lower methylnaphthalene conversion and faster deactivation than ZSM-5. However, Jin et al. (2008) investigated the methylation of 2-MN over modified ZSM-5 type zeolite catalyst in a fixed-bed micro-reactor at 400 °C with a reactant mixture of 2-MN, methanol and mesitylene having a molar ratio of 1:5:3, respectively. Both catalytic activity and lifetime of ZSM-5 zeolite catalyst were improved by NaOH treatment. Additionally, a higher 2,6-DMN/2,7-DMN ratio, higher selectivity and higher yield of 2,6-DMN were obtained over Zr-modified mesoporous ZSM-5. The disproportionation of 2-MN over Zr-modified ZSM-5 zeolite catalyst in a fixed-bed reactor at 400–450 °C has been investigated for five different weight hourly space velocities by (Güleç et al. 2016). The results revealed that Zr-modified ZSM-5 improved the catalytic activity of ZSM-5 in the disproportionation reaction. Furthermore, Liang et al. (2010) mentioned that Pt-modified ZSM-5 catalyst showed lower coke formation, higher conversion of 2-MN, higher selectivity and higher yield of 2,6-DMN compare with HZSM-5. In another study, Niftaliyeva and Karaduman (2015) investigated the methylation of 2-MN over Cu- and La-impregnated Y zeolite catalyst using a feed mixture of 2MN, methanol and 1,3,5-trimethylbenzene having a molar ratio of 1:5:5. The type Y zeolite catalyst resulted in a very high conversion of 2-MN. Moreover, La impregnation enhanced the conversion activity of Y zeolite catalyst. Although 2-MN is one of the widely used raw material in the production of 2,6-DMN, whereas naphthalene is also another alternative starting material. Wu et al. (2010) established the effect of Al, Ga and Al/Ga impregnated ZSM-12 on the methylation reaction of naphthalene. According to their results, the highest conversion of naphthalene was obtained over Al/Ga-modified ZSM-12 and the highest 2,6-DMN percentage and highest 2,6-DMN/2,7/DMN ratio were also observed over Ga-modified ZSM-12. Song et al. (2007) investigated shape selective methylation of naphthalene for the synthesis of 2,6-DMN with Ti-, Co- and Fe-modified ZSM-5 zeolite catalyst. The results illustrated that the highest conversion of naphthalene, the highest percentage of 2,6-DMN and highest 2,6-DMN/2,7/DMN ratio obtained over Fe-impregnated ZSM-5 as compared with Ti- and Co-modified ZSM-5. The synthesis of 2,6-DMN with isomerization reaction was studied by Motoyuki et al. (2000) and they investigated isomerization of DMN isomers to produce 2,6-DMN. According to their results, an effective synthesis process of 2,6-DMN is possible by utilizing a non-valuable feed stream that mainly includes naphthalene and DMN isomers. In addition, isomerization reaction of the mixture of DMN isomers occurred over MCM-22 zeolite catalyst. The isomerization reaction also showed that 2,6-DMN can be enriched in the mixture effectively. Although there have been a few studies on the synthesis of 2,6-DMN, the desired values and economical process have not yet been developed. The catalysts used in the methylation reaction play an important role in the synthesis procedure to achieve high 2,6-DMN selectivity. Therefore, a catalyst such as beta zeolite can be used in both methylation (Park et al. 2002; Van der Mynsbrugge et al. 2012) and isomerization (Wang et al. 1997; Motoyuki et al. 2000) processes and could give higher selectivity for specific DMN isomers. In previous studies, neither Cu- nor Zr-impregnated beta zeolite catalyst has been used for the methylation of 2-MN which is the novelty of the present work. In this study, the methylation of 2-MN is carried out in a fixed-bed reactor over beta zeolite (BZ), Cu-impregnated beta zeolite (CuBZ) and Zr-impregnated beta zeolite (ZrBZ) catalysts. The conversion of 2-MN, the ratio of 2,6-DMN/2,7-DMN and the selectivity of 2,6-DMN are investigated to demonstrate the activity of the beta type zeolite catalysts. Beta zeolite, in granular form (6–8 mm), was supplied by ACS Material Corporation (USA). The metal salts such as copper (II) nitrate trihydrate (Cu(NO3)2·3H2O) and zirconium (IV) oxynitrate hydrate (ZrO(NO3)2·xH2O) were obtained from Sigma-Aldrich (USA) and Across Organic (USA), respectively. The ammonium form of beta zeolite catalyst was calcined at 550 °C for 4 h to get proton form beta zeolite catalysts (BZ). Next, copper (II) nitrate trihydrate and zirconium (IV) oxynitrate hydrate metals were impregnated into the structure of beta zeolite using a typical wet impregnation method (Güleç et al. 2016, 2017). To prepare Cu-impregnated beta zeolite catalyst (CuBZ), 3.25 gm of copper (II) nitrate trihydrate was dissolved into 20 ml deionized water. After all copper (II) nitrate salt dissolved, 8 gm of BZ was added to the aqueous solution. The mixture was then kept at room temperature overnight for impregnation. After impregnation, the dried solid particles dried at 120 °C for 4 h and calcined at 550 °C for 6 h. The modified catalyst was designated as CuBZ. Zr-modified beta zeolite catalyst was prepared exactly the same experimental conditions with using 2.027 gm of zirconium (IV) oxynitrate hydrate and was labeled as ZrBZ. The studies demonstrated that zirconium (IV) oxynitrate hydrate decomposed to the tetragonal phase of ZrO2 (Štefanić et al. 1999), and copper (II) nitrate trihydrate decomposed to CuO under the experimental conditions that used in this study (Li et al. 2018). The scanning electron microscopy (SEM) and energy-dispersive X-ray (EDX) analysis were performed using a ZEISS EVO 40 microscope operated at 20 kV. Additionally, the amount of metal loaded on the beta zeolite catalysts surface were measured using a Spectra XLAB-2000 PEDX-ray fluorescence (XRF) spectrometer. The infrared analysis of the catalyst was carried out using a Mattson 1000 Fourier transform infrared spectrometer (FTIR). The FTIR analysis was performed as follows; the pellets (0.109 gm/cm2) were prepared by pressing the sample powders at 10 kPa. All of the samples were scanned 30 times per analysis at 16 cm−1 resolution within the 400–4000 cm−1 infrared region. Moreover, the nature of acid sites of the prepared catalysts was characterized by the same FTIR spectroscopy (Py-IR). In the Py-IR experiments, pyridine was used as a probe molecule. Prior to pyridine adsorption, the calcined zeolite catalysts were cooled down to room temperature and located into a desiccator. Pyridine was then dosed onto the samples until saturation, and they were kept in a desiccator for 24 h. The textural properties of prepared beta zeolite catalysts were derived from nitrogen sorption measurements using a Quantachrome NOVA 2200 N2 sorption instrument. The specific surface area of the samples was calculated according to the BET method (Barrett et al. 1951; Fagerlund 1973), and the pore volume was determined using the BJH method (Barrett et al. 1951). Catalytic tests were carried out in a continuous-flow fixed-bed reactor as shown in Fig. 1. The experimental setup consists of a high-pressure liquid pump, a nitrogen tube, a flowmeter, a stainless steel tubular fixed-bed flow reactor surrounded by a furnace with a PID temperature controller, a condenser, a phase separator and a GC–MS. The fixed-bed reactor was charged with 2 mL of catalyst in the form of spherical pellets. For activation, the catalyst was pretreated inside the reactor under N2 atmosphere (5 mL/min) at 500 °C for 60 min. The temperature was then set to a value at which the experiment was to be performed. The feed mixture of 2-MN, methanol and 1,3,5-trimethylbenzene (TMB) with a 1:5:5 molar ratio was injected through a high-pressure liquid pump into the fixed-bed reactor at atmospheric pressure. The temperature of the experiments was varied between 400 and 500 °C. The weight hourly space velocity (WHSV) was changed from 1 to 3 h−1, designated as WHSV1, WHSV2 and WHSV3 for 1 h−1, 2 h−1 and 3 h−1, respectively. The reaction products were condensed using a cooler at −10 °C. 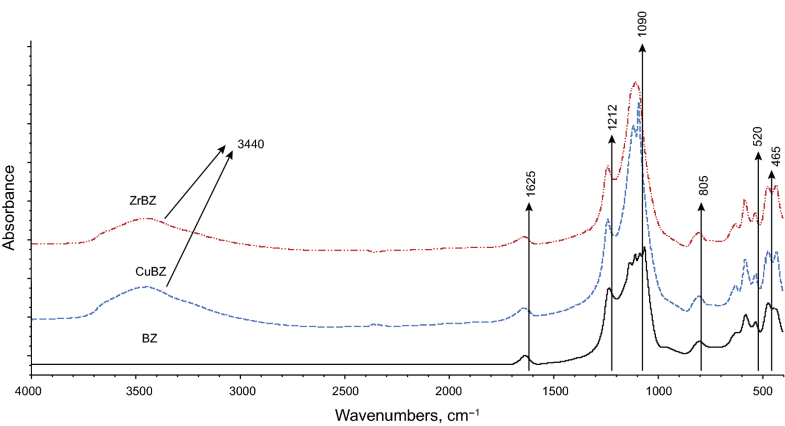 The reactants and products were analyzed using a Thermo Finnegan DSQ 250 GC–MS (gas chromatography–mass spectrometry) with a ZB-1 MS capillary column (60 m, 0.25 mm internal diameter, 0.25 film thickness). The temperature for the injection, MS transfer line and ion source were kept at 280, 300 and 230 °C, respectively. DMN isomers in the products can be easily separated using a column temperature programmer. First, it was heated from 95 to 125 °C with a ramping of 1 °C/min, and then from 125 to 200 °C with a ramping of 5 °C/min and finally from 200 to 230 °C with a ramping of 20 °C/min with a He flow rate of 0.7 mL/min as carrier gas. where M2-MN,0 and M2-MN,t are the mass percentages of 2-MN before and after the reaction, S2,6-DMN is the selectivity of 2,6-DMN, M2,6-DMN is the mass percentage of 2,6-DMN after the reaction and MDMN is the mass percentage of total dimethylnaphthalenes (DMN). MTMN is the mass percentage of total trimethylnaphthalenes (TMN) after the reaction, MMN is the mass percentage of total methylnaphthalene (MN, without 2-MN) after the reaction. M2,7-DMN is the mass percentage of 2,7-DMN and R2,6/2,7 is the ratio of 2,6-DMN/2,7-DMN. Methylation of 2-MN was carried out in a fixed-bed reactor over BZ, CuBZ and ZrBZ zeolite catalysts under a nitrogen atmosphere. The possible methylation and isomerization reactions pathways of 2-MN are presented in Fig. 2. The isomerization reaction can occur between methylnaphthalene, dimethylnaphthalene (DMN) and trimethylnaphthalene (TMN) isomers. As for the methylation reaction, it can occur from 2-MN to DMN and/or TMN. Furthermore, 1-MN produced by isomerization of 2-MN may also produce DMN and/or TMN by a methylation reaction. Additionally, DMN isomers can also give a methylation reaction with methanol and produce TMN isomers. The experimental results support the proposed isomerization reaction from 2-MN to 1-MN and methylation reaction from 2-MN to DMN/TMN (more information presented in the Product distribution section). Additionally, it is known that the beta zeolite catalyst is used for both methylation (Park et al. 2002; Van der Mynsbrugge et al. 2012) and isomerization (Wang et al. 1997; Motoyuki et al. 2000) processes. The methylation from DMN to TMN and isomerization between DMN isomers and TMN isomers has; therefore, a high possibility is shown in proposed reaction mechanism. The energy-dispersive X-ray (EDX) mapping of untreated beta zeolite catalyst (BZ) and metal impregnated beta zeolite catalysts (CuBZ and ZrBZ) is presented in Fig. 3. It is evident from these results that both Cu and Zr were successfully impregnated on the beta zeolite structure. Additionally, the dispersion of metals, Cu and Zr, on the beta zeolite seemed homogenous. 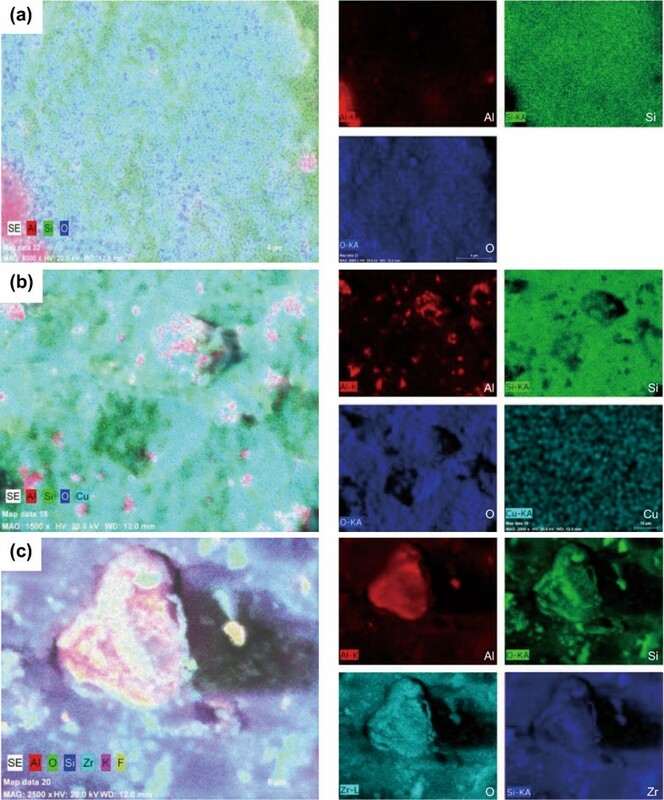 SEM results of untreated and metal impregnated beta zeolite samples are presented in Fig. 4. The EDX mapping and SEM images proved that there was no agglomeration after Zr impregnation. Additionally, no morphological decomposition was seen on the beta zeolite with Zr modification (Fig. 4). The amount of impregnated metal was measured by XRF analysis, and results are presented in Table 1. The elemental analysis demonstrates successful impregnation of Cu and Zr. The Fourier transform infrared (FTIR) spectrum of all catalysts is presented in Fig. 5. The FTIR spectrum contains a group of absorption bands where the peaks at around 520 and 465 cm−1 indicate the presence of five-membered double rings, typical of beta zeolite and assigned to vibrations of T–O–T (T: Si or Al) siloxane bonds in the rings (Subsadsana et al. 2016; Thakur et al. 2016; Güleç et al. 2016; Shanjiao et al. 2007), respectively. The absorption band at around 805 cm−1 demonstrates internal bonds of the tetrahedral SiO4 structural unit (Güleç et al. 2016). Another band at around 1090 cm−1 indicates internal asymmetric stretching of the T–O–T bond (Miao et al. 2016; Thakur et al. 2016; Shanjiao et al. 2007) and the band at about 1212 cm−1 indicates external asymmetric stretching of T–O–T (Thakur et al. 2016). The other wide band at about 3300–3600 cm−1 is associated with H bonded, O–H groups (Omegna et al. 2004; Miao et al. 2016; Sreedhar et al. 2009; Toktarev et al. 2010). An almost linear decrease was observed in the position of the main T–O–T vibrations at about 1100 cm−1 with increasing Zr content in MFI framework (Szostak 1989). Jin et al. (2006) also expressed this idea in their study on the selective synthesis of 2,6-DMN by methylation of 2-MN with methanol over Zr/(Al)ZSM-5. 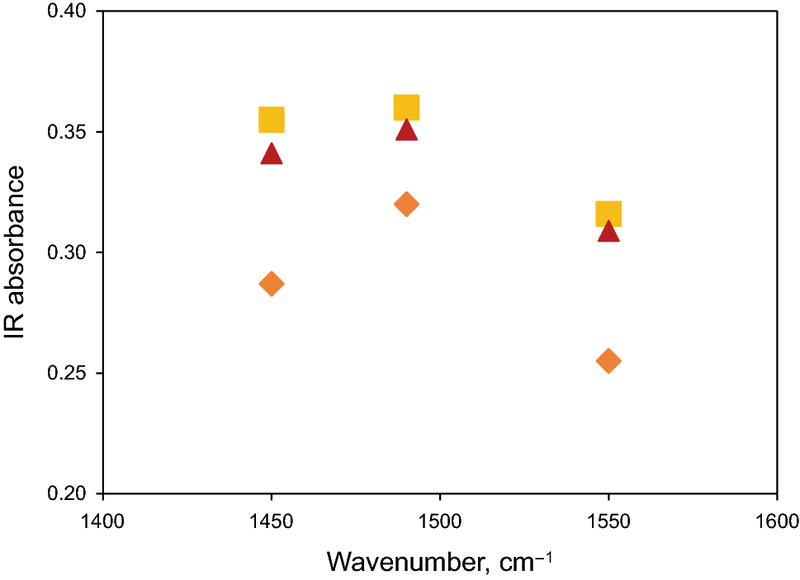 The absorbance values along with Py-IR spectra are presented in Fig. 6. The absorbance values for Lewis (about 1450 cm−1), Lewis + Brönsted (about 1495 cm−1) and Brönsted (about 1550 cm−1) acid sites have not shown significant differences with the impregnation of Cu, while they were clearly decreased after the impregnation with Zr. It was noticed that the total acidic amount and proportion of strong acid sites decreased with an increase in the ratio of Zr/Al, and these findings correlate with those by Jin et al. (2006). Table 2 presents the surface and pore structure parameters of untreated beta zeolite catalysts (BZ) and metal impregnated beta zeolite catalysts (CuBZ and ZrBZ). The BET surface area is slightly decreased from 424 to 406 m2/g with Cu impregnation, while it is insignificantly affected with Zr modification, 427 m2/g as mentioned by (Jin et al. 2006). On the other hand, pore diameter increased with Cu and Zr modification. Figure 7 shows the N2 adsorption–desorption isotherms of the mesoporous beta zeolite catalyst and Cu- and Zr-impregnated beta zeolite catalysts. According to International Union of Pure and Applied Chemistry (IUPAC) classification, the isotherms may be defined as type IV (Betiha et al. 2015; Jin et al. 2008). In the IUPAC classification, porous materials having a diameter of 20–500 Å are classified as mesoporous (IUPAC 1997). The isotherms of BZ, CuBZ and ZrBZ contain a hysteresis loop at high P/P0 values (higher than 0.4) which is typical for mesoporous materials (Egeblad et al. 2017). However, the hysteresis loop of Cu-impregnated beta zeolite catalyst looks slightly different from beta zeolite catalysts, while Zr-impregnated beta zeolite catalyst has a very similar structure. These differences after Cu impregnation were also observed on the BET surface area results and are shown in Table 2. The characterization results demonstrate the structure of beta zeolite still remains intact after modification with Zr. To demonstrate the activity of the untreated beta zeolite and Cu- and Zr-impregnated beta zeolite catalysts, the conversion values of 2-MN are calculated using Eq. (1). The conversion rates for BZ, CuBZ and ZrBZ catalysts are presented in Figs. 8, 9 and 10, respectively. 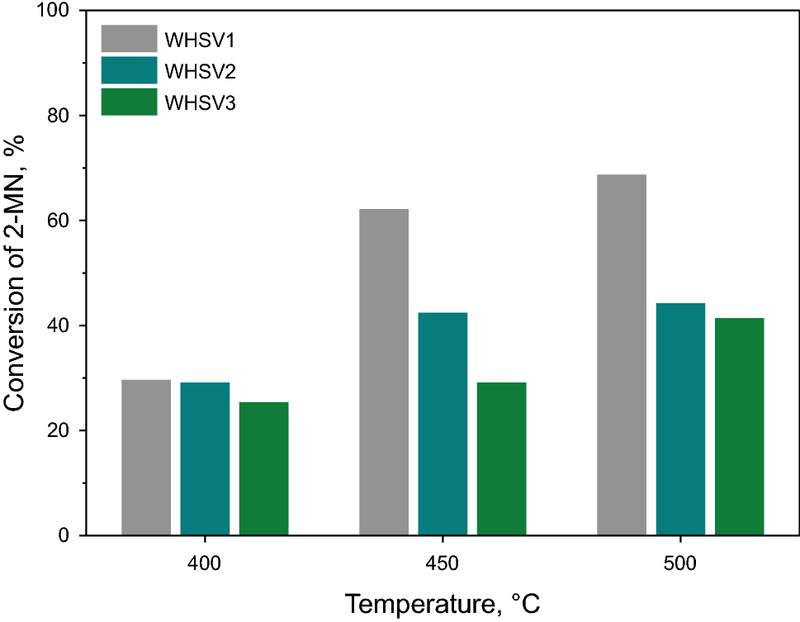 Once the beta zeolite catalyst was used for the methylation of 2-MN reaction as a catalyst, the conversion of 2-MN substantially increases with an increase in temperature, but it decreases with increasing WHSV. Figure 10 indicates that when the temperature increases from 400 to 450 °C, the conversion rate sharply increases from 30% to around 60% and reaches to about 70% at 500 °C for WHSV1 over BZ. On the other hand, at high WHSV conditions, the conversion does not increase as much as it was in the case of WHSV1 for BZ. Figure 9 represents the conversion of 2-MN when Cu-modified beta zeolite catalyst was used for the methylation of 2-MN. The conversion trends of 2-MN over CuBZ look almost similar as it is on BZ. 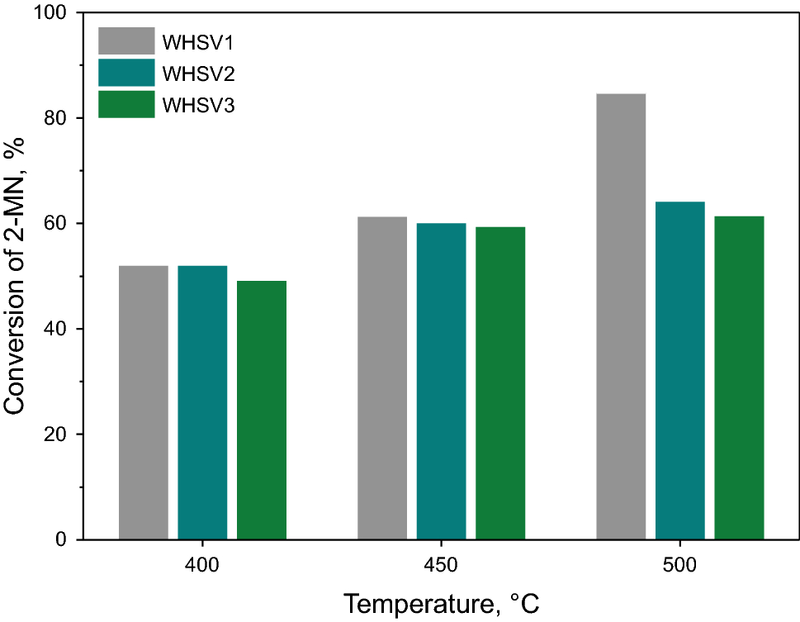 The conversion of 2-MN increases from 31% to 70% with an increase in temperature from 400 to 500 °C at WHSV1. At the same temperatures, the conversion of 2-MN also increases from 28% to 43% and from 20% to 30% at WHSV2 and WHSV3, respectively. Therefore, it could be concluded that Cu impregnation on beta zeolite catalyst has an insignificant effect on the conversion of 2-MN compared with BZ. For ZrBZ, Fig. 10 reveals that it is possible to reach much higher conversion rate at low temperatures compared with CuBZ and BZ catalysts. The lowest conversion of 2-MN over ZrBZ is about 50% at 400 °C with WHSV3, and the highest conversion is approximately 80% at 500 °C with WHSV1. The Zr impregnation enhances the activity of beta zeolite in terms of methylation reaction of 2-MN compared with the conversion results of BZ. This could be due to the enlargement of pore dimensions and the weakening of Lewis and Brönsted acidities after Zr impregnation. These findings correlate with those of Jin et al. (2006), where the improvement in the catalytic performance was also mainly attributed to both the weakening of acid strength and the expansion of pore dimensions that occurred after Zr impregnation into ZSM-5. Moreover, the Zr impregnation on ZSM-5 has also enhanced the conversion of 2-MN on the disproportionation reaction of 2-MN and similar results are reported by (Güleç et al. 2016). These conversions results of 2-MN for ZrBZ are also comparable with previous studies (Pu and Inui 1996; Jin et al. 2008; Liang et al. 2010; Niftaliyeva et al. 2015; Niftaliyeva and Karaduman 2015; Güleç et al. 2016, 2017; Jin et al. 2006). The highest conversion value of 2-MN has been found as 10% over Zr/(Al)ZSM-5 by (Jin et al. 2006), as about 43% over 8 h alkaline treated ZSM-5 sample by (Jin et al. 2008) and as 30% over HZSM-5 by (Güleç et al. 2016). However, these differences in conversion values could also be attributed to different experimental conditions used by different researchers. The selectivity of 2,6-DMN was calculated using Eq. (2), and the results are presented in Figs. 4, 5 and 6 for WHSV1, WHSV2 and WHSV3, respectively. As shown in Fig. 11, the 2,6-DMN selectivity shows a decreasing trend with an increase in temperature at WHSV1. This decrease is from 9% to 4% for BZ, 13% to 6% for CuBZ and 14% to 8% for ZrBZ with temperature increasing from 400 to 500 °C at WHSV1. The increase in the synthesis of other DMN isomers at high temperature could explain this decreasing selectivity of 2,6-DMN at 500 °C. A higher 2,6-DMN selectivity is obtained on both Cu- and Zr-impregnated beta zeolite catalysts compared with untreated beta zeolite at WHSV1. Similar decreasing trends in the selectivity with increasing temperature were also noticed at WHSV2 as can be seen in Fig. 12. However, when the weight hourly space velocity increases from WHSV1 to WHSV2, the selectivity of 2,6-DMN starts increasing for both BZ and ZrBZ, while it demonstrates a clear decrease for CuBZ. 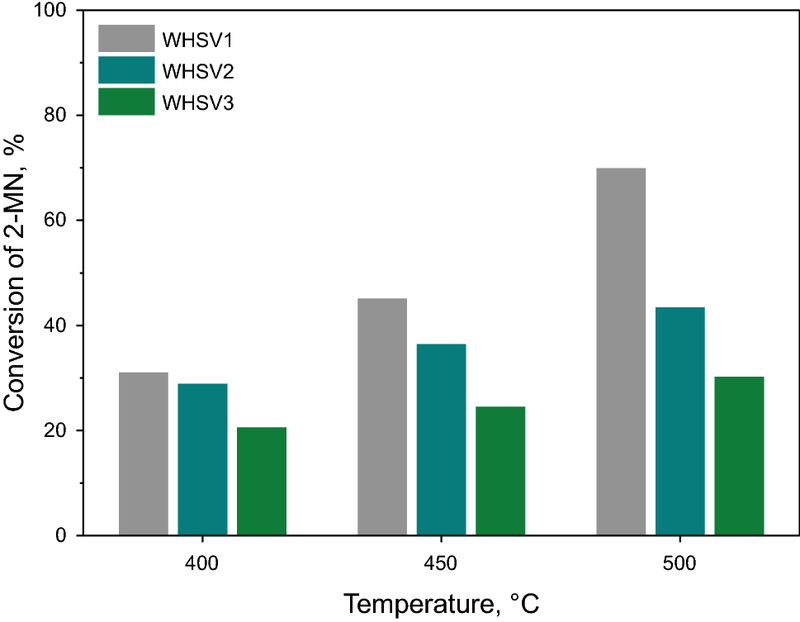 The selectivity increased from 14% to 20% for ZrBZ but decreased from 13% to 7% for CuBZ at 400 °C with increasing WHSV from 1 to 2 h−1. Therefore, the Zr modification enhanced 2,6-DMN selectivity, but on the other hand, Cu impregnation decreased the selectivity at WHSV2. According to Fig. 13, when the weight hourly space velocity increased from 2 to 3 h−1, the selectivity of 2,6-DMN decreased over BZ, CuBZ and ZrBZ at 400 and 450 °C. However, it was slightly higher at 500 °C over BZ, CuBZ and ZrBZ. 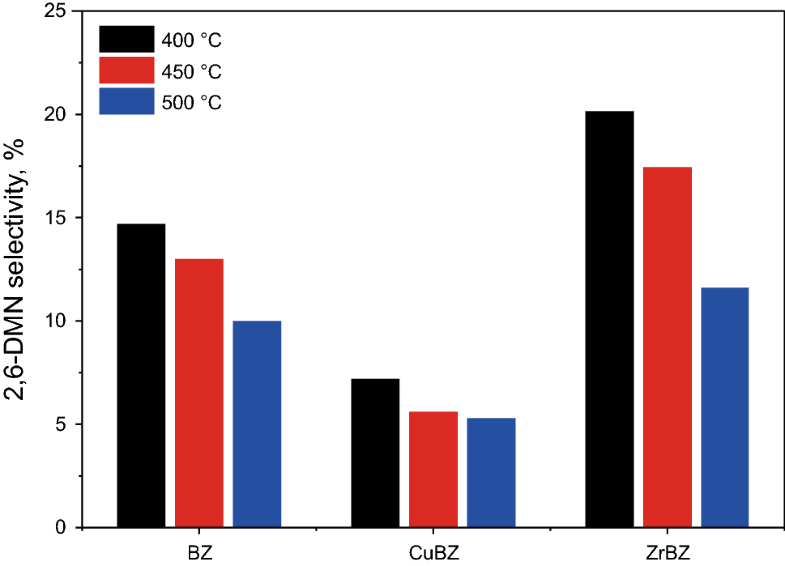 In general, ZrBZ showed higher selectivity at low temperature, 400 °C, compared with BZ and CuBZ. Furthermore, the highest 2,6-DMN selectivity, about 20%, was attained over Zr-modified beta zeolite catalyst at 400 °C with WHSV2. These selectivity results of 2,6-DMN also correlate with the findings of Jin et al. (2006) where they mentioned that when a small quantity of Zr is incorporated in the framework of ZSM-5, the selectivity of 2,6-DMN is obviously improved in the methylation of 2-MN. The ratio of 2,6-DMN/2,7-DMN at different temperatures is presented in Fig. 14. The ratio of 2,6-DMN/2,7-DMN is generally greater than 1.0 for BZ, CuBZ and ZrBZ zeolite catalysts. The higher ratio of 2,6-DMN/2,7-DMN can enable an easy subsequent separation because a eutectic mixture would be formed at a ratio of 0.7 (Millini et al. 2003). 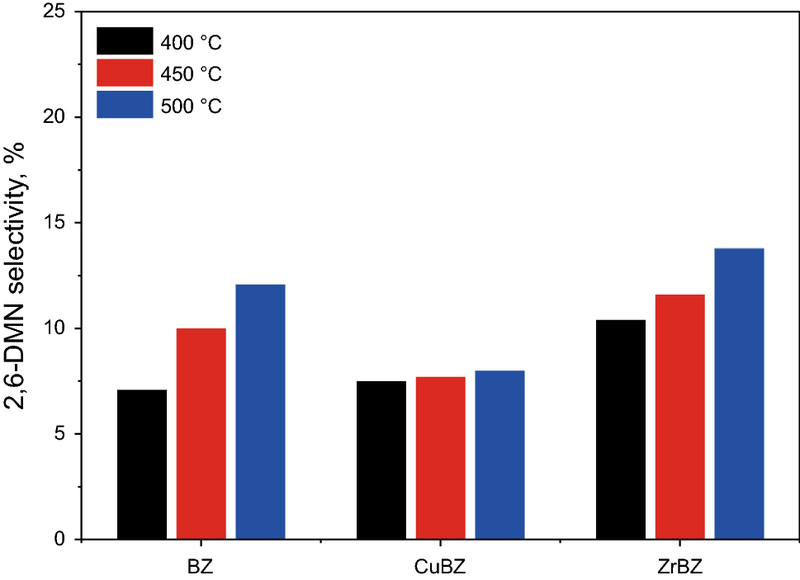 However, a decrease in the ratio of 2,6-DMN/2,7-DMN was noticed after both Cu and Zr impregnation on beta zeolite at 400 °C and 450 °C for WHSV2 and WHSV3. Generally, the ratio of 2,6-DMN/2,7-DMN is higher than 1.0. Moreover, an increase in the ratio can be observed over Cu and Zr impregnation at 500 °C for WHSV1. While a great increase in the ratio about 2.5–3.0 of 2,6-DMN/2,7-DMN after Zr impregnation on ZSM-5 was investigated by Jin et al. (2006), where Zr impregnation on beta zeolite catalysts has not much effect on the ratio. The ratio of 2,6-DMN/2,7-DMN is between 1.1 and 1.7 for BZ, 1.0 and 1.4 for CuBZ and 1.2–2.6 for ZrBZ as shown in Fig. 14. The weight percentage distributions of 1-MN and DMN isomers in the product stream are provided in Table 3. The production distribution results are at WHSV2 space velocity conditions where the highest 2,6-DMN selectivity was achieved. The 2,6-DMN and other DMN isomers such as 2,7-DMN, 1,3-DMN, 1,2-DMN and 2,3-DMN are synthesized with methylation of 2-MN over BZ, CuBZ and ZrBZ. It is clear that the beta zeolite catalyst and Cu- and Zr-impregnated beta zeolite catalysts have a selective shape for both 1,3-DMN and 2,6-DMN. These two isomers are the highest among the other DMN isomers for both beta zeolite catalyst and metal impregnated beta zeolite catalysts used in the present study. 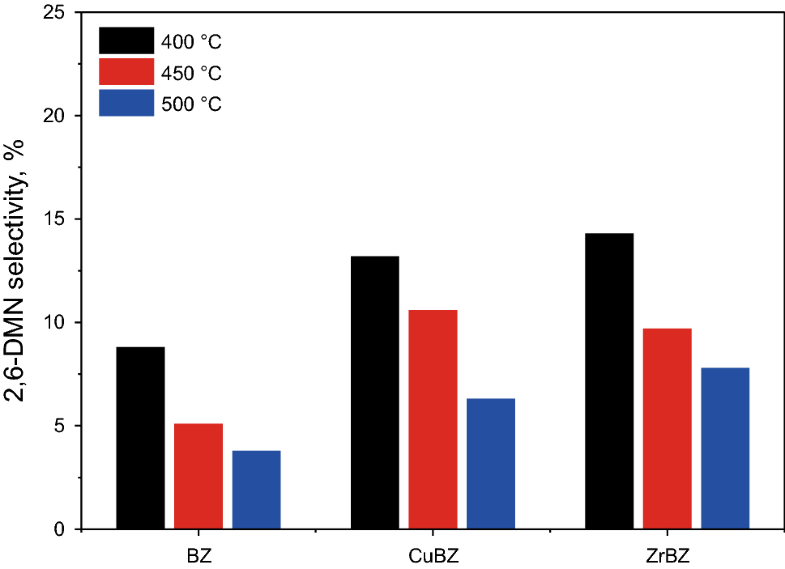 The amount of 2,6-DMN is dramatically increased from a low value, 0.20% and 0.37%, to very high value, 2.42% and 2.20%, when temperature increased from 400 to 500 °C for both BZ and CuBZ, respectively. As mentioned before, the Cu impregnation has an insignificant effect on the synthesis of 2,6-DMN with methylation of 2-MN. However, the Zr impregnation has an important effect on the synthesis of DMN especially 1,3-DMN and 2,6-DMN. For example, the weight percentage of 2,6-DMN is about 2.58% at 400 °C which is 10 times higher than BZ and almost 7 times higher than CuBZ at the same temperature. In addition to DMN isomers, 1-MN is also synthesized by isomerization of 2-MN. The percentage of 1-MN in the product stream increases when the temperature increased from 400 to 500 °C, also shown in Table 3. Over CuBZ, the weight percentage of 1-MN is about 10 times higher at 500 °C than as it was at 400 °C. It was explained by the acid strength differences of the catalyst in the alkylation and isomerization reactions by Komatsu et al. (1999). Weak acid sites only catalyze the alkylation while the isomerization reaction tends to occur in the presence of strong acid sites. The increase in the selectivity of DMN isomers thanks to the Zr impregnation might be attributed to the weak acid sites while the increase in the 1-MN once CuBZ is used in the methylation of 2-MN may be attributed to the strong acid sites. Although TMN isomers were also synthesized by the methylation of 2-MN, the percentages of TMN are not presented in this paper due to the low amounts. The defined products in the product stream prove both the isomerization reaction from 2-MN to 1-MN and the methylation reaction from 2-MN to DMN/TMN isomers. Therefore, the proposed reaction mechanism presented is supported by the experimental results. The effects of Cu- and Zr-impregnated beta zeolite catalysts on the methylation of 2-MN were experimentally investigated. 2-MN conversion increases with an increase in the temperature and decreases with an increase in the WHSV for BZ, CuBZ and ZrBZ. The conversion reached a peak level at 500 °C and WHSV1 for all three catalysts: BZ, ZrBZ and CuBZ. However, the highest conversion was reached on Zr-modified beta zeolite catalyst at both low and high temperatures. In addition to the conversion, the highest 2,6-DMN selectivity of about 20% and the highest ratio of 2,6-DMN/2,7-DMN of about 2.6 were also achieved over ZrBZ. In addition to 2,6-DMN, the other DMN isomers such as 2,7-DMN, 1,3-DMN, 1,2-DMN and 2,3-DMN are also synthesized with methylation of 2-MN. The beta zeolite structure is more selective for 1,3-DMN and 2,6-DMN compared to other DMN isomers. The Cu impregnation enhanced the isomerization reaction from 2-MN to 1-MN, whereas the Zr impregnation improved the methylation reaction from 2-MN to DMN isomers, mainly 1,3-DMN and 2,6-DMN. For the future work, lower weight hourly space velocities are suggested to increase the selectivity of 2,6-DMN. Moreover, two serial fixed-bed reaction systems could be investigated to increase the selectivity of 2,6-DMN and the conversion rate. Furthermore, a cheap naphthalene source such as the coal tar naphthalene oil fraction which is a waste product of the iron and steel industry could be used as a raw material which could bring down the production cost of 2,6-DMN. This work is supported by The Scientific and Technological Research Council of Turkey [TÜBİTAK Project No. 112M297].